Long time no see, dear friends and peace lovers. Despite the fact that we were a bit quiet since our last project in Berlin (read about some awesome things we’ve done there in our May blog edition), we patiently worked on our big quest on uplifting the spirit of freedom among different cultures. So, where did our dedication take us now? To Pančevo, a peaceful town in the north part of Serbia. If you are wondering whether something has changed in our epic multicultural team, the answer is no. We still have the same feelings, emotions and, above all, mission, but among different faces connected by the same spirit. Therefore, for the next ten days, Pančevo will be home to young people from Germany, Italy, Portugal, Israel and Serbia expressing themselves and their inner truth trough art. Fasten your seatbelts, because we are taking you on a fun ride! Don’t be tricked by the date, but the gathering started on 19th August, and, so far, many good and exciting things happened. First of all, the almighty crew gathered its forces in Pančevo where we organized few interesting energizers for all of the crew members. After chatting and having fun with both the familiar and new faces, Portuguese pirates decided to spice it up a bit. Is there a better way of announcing the official opening of the FreeDom Festival of Art and Music for Human Rights project than entertaining and inviting people to join us with a Portuguese specialized band for collective euphoria, Farra Fanfarra, playing in front of the freshly painted graffiti near the City hall? Trust us, the answer is no. We nailed it! Citizens of Pančevo were enjoying it immensely, so we invited them to continue in the same way on Farra Fanfarra’s concert that began at 9.30 PM at the Youth center. Meanwhile, we had a little gathering at the Youth center that we love to call the Intercultural dinner, where we had a chance to introduce each participants country’s traditional cuisine. Too bad you weren’t there, coz it sure was delicious! So, we got some fuel and went to the concert where local people and foreigners had a chance to feel the spirit of Portugal’s streets. The atmosphere exploded! More than twelve musicians were on the stage playing trumpets, saxophones, guitars, drums and other instruments. Our Portuguese brothers played for more than an hour, showing that Guča (famous Serbian trumpet festival) is not the only place with “out of this world” brass bands. Yes, believe it or not, Portugal has it too, and now you know their name. Stay tuned, folks, because this is just the beginning. 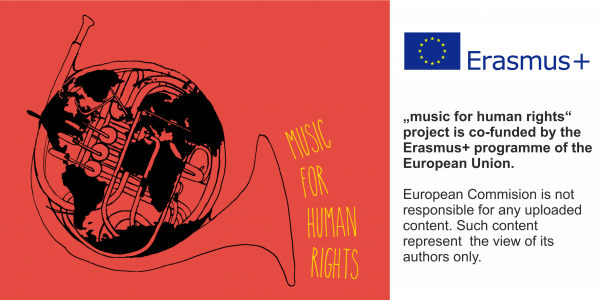 Follow us on our Facebook page (https://www.facebook.com/musicforhumanrightsyp/?ref=bookmarks) and Instagram profile (https://www.instagram.com/musicforhumanrights/?hl=it) , where new and fresh stories are coming out each day. We have a lot of love to share with you. Credits: S.U. , S.M. , M.G.C., J.P. & M.D.